When a Jehovah's Witness reads this top ten list, they either conclude the Watchtower organization engages is satanic quoting practices, or become dishonest themselves! This list is so powerful and irrefutable, that Jehovah's Witnesses have no idea how to deal with it! Their usual response is to quietly withdraw back into the shadows of anonymity from which they came. The Top 10 List: "Worst of the worst" of Watchtower satanic quoting in their booklet: "Should you believe in the Trinity?". This Satanic little booklet is used by Jehovah's Witnesses to deceive the public into thinking that Trinity is a pagan doctrine. The booklet quotes close to 100 sources in total. We have included here a small sampling of their quotes. First, we have included Watchtower quotes from 8 unbelieving Christianity Trashers to prove trinity is pagan, who don't even believe the Bible! Had the Watchtower told you that these eight men also said that the entirety of Christianity was of pagan origin, we would withdraw our criticism! But the Watchtower makes it appear that these are eight men reject Trinity as pagan false doctrine, but believe the rest of the Bible doctrines as true. It is actually quite shocking, so fasten your seatbelt and make sure you are sitting down! We have also included two examples of how the Watchtower deliberately misquotes Bible believing Trinitarians and makes them say stuff that is opposite to what they intended. We strongly recommend you read the "Hostile witness approach" misused by the Watchtower as proof of satanic quoting practices. The author is a Christianity Trasher! "the fact has to be faced that New Testament research over, say, the last thirty or forty years has been leading an increasing number of reputable New Testament scholars to the conclusion that Jesus himself may not have claimed any of the Christological titles which the Gospels ascribe to him, not even the functional designation 'Christ', and certainly never believed himself to be God." So these "scholars" not only reject that Jesus claimed to be God, but that he also never claimed to be the messiah! We simply cannot understand why the Watchtower loves quoting these Christianity Trashers! Hopkins is a Christianity Trasher! Look at the rest of the sentence: "The beginning of the doctrine of the Trinity appears already in John " (c. 100). To Jesus and Paul the doctrine of the trinity was apparently unknown"
So while Hopkins believes Jesus and Paul rejected trinity, he says one sentence before, that the Gospel of John clearly teaches it! Of course Hopkins is another flaming Christianity Trasher who also said: "Finally, the life, temptation, miracles, parables, and even the disciples of Jesus have been derived directly from Buddhism." So Hopkins thinks that Trinity AND most of the Watchtower doctrines were derived from Buddhism! Wow! A very convincing proof indeed! Morenz is a Christianity Trasher! Look at the sentence in red below that they left out. In a most perplexing paradox, Morenz, who doesn't believe the Bible, actually says the Bible teaches trinity. He is not saying Trinity is of pagan origin, but the entire Bible itself! "trinity was a major preoccupation of Egyptian theologians. ... three gods are combined and treated as a single being, addressed in the singular. In this way the spiritual force of Egyptian religion shows a direct link with Christian theology. In order to avoid any gross misunderstanding, we must at once emphasize that the substance of the Christian Trinity is of course Biblical: Father, Son and Holy Ghost. The three are mentioned alongside one another in the New Testament, probably for liturgical reasons." Morenz, is a Christianity Trasher! Not only does he say trinity is pagan, but notice that he also says that the expressions, 'second death' in the Revelation [chapter 20:14] 'crown of life' [James 1:12], 'crown of righteousness' were borrowed from the pagans! 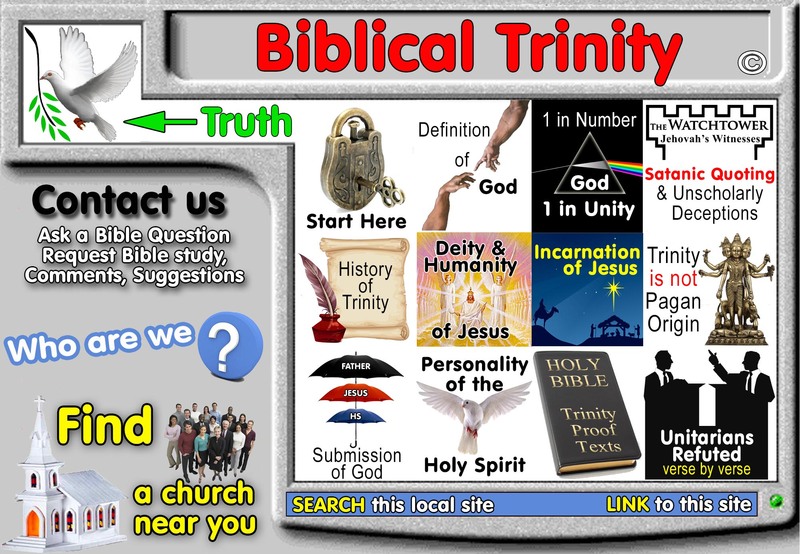 Having said this, Morenz actually says that the Bible clearly teaches the trinity! He doesn't Believe the Bible, thinks the Bible itself is of pagan origin, but that the Bible teaches trinity! What utter satanic deception the watchtower uses! Durant is a Christianity Trasher! Look at the full sentence in red below that they left out. "Christianity did not destroy paganism; it adopted it ... From Egypt came the ideas of a divine trinity, the Last Judgment, and ... reward and punishment" So not only is trinity pagan, but also judgement day! Durant actually accuses the apostles of borrowing their doctrine from Paganism in the same sentence! Arthur Weigall: The Paganism in Our Christianity. Weigall is a Christianity Trasher! We call Weigall, the Watchtower's "star witness" in the case to prove trinity is pagan. He is used in the introduction and twice more in the booklet. Yet, Weigall trashes all of Christianity and also says that the Lord's Supper, Baptism and the virgin birth and trinity are all of pagan origin! Abbot is a Christianity Trasher! It is dishonest for the Watchtower to not tell you the author also trashes all church organization, baptism, the Lord's supper and the doctrine of blood atonement, and trinity in the same breath! Gibbon is a Christianity Trasher! Harnack is a Christianity Trasher! Here is what Harnack said a few sentences before: "The Christian religion in the 3rd century made no compromise with any of the pagan religions" But Harnack is a Christianity Trasher. "Harnack started with anti-Christian and anti-supernaturalistic presuppositions . . . Harnack's methods and assumptions forced him to reject major doctrines of Christianity such as the Virgin birth, the deity and pre-existence of Jesus, the Resurrection of the body, the possibility of miracles, the existence of demons, exorcism and Jesus as the promised Messiah." Harnack says that the church up to the 3rd century, was NOT AFFECTED by paganism. This the Watchtower did not want you to see, because it contradicts what they believe! So here is an example of the Watchtower twisting even what a Christianity Trasher says! The Watchtower deliberately fails to tell you that Fortman's comment is specifically directed at only Old Testament writers to the exclusion of New Testament writers. The Watchtower makes it sound like Fortman is making a comment on the entire Bible! Look at the complete sentence! At first the Christian faith was not Trinitarian in the a strictly ontological reference.